Erica Emery, of Rustic Roots Farm, began working with MFFM in 2016 to explore how to bring Maine Harvest Bucks to the Farmington Farmers’ Market. It took 2 years of “almosts” and “maybes” to find the perfect local partner to support the project and help get it off the ground. This year, the market is triumphant in launching its SNAP and Maine Harvest Bucks program. 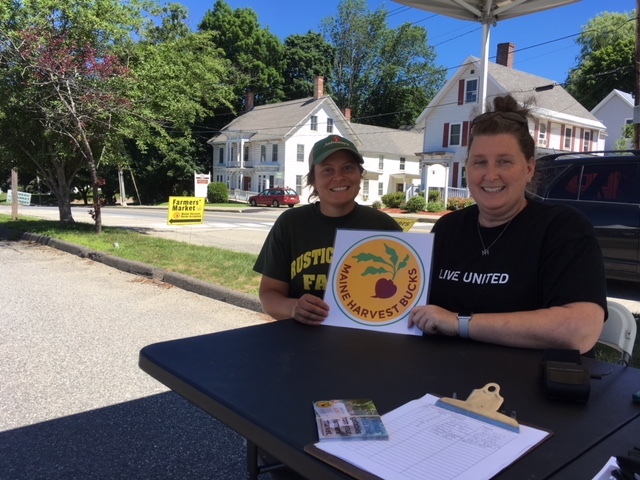 In partnership with the United Way of the Tri-Valley Area, the Farmington Farmers’ Market now accepts SNAP/EBT at its market and provides bonus Maine Harvest Bucks to SNAP shoppers to spend on fruits and vegetables. Erica Emery and Nichole Ernest pose during the Maine Harvest Bucks launch. Saturday, July 7th, was the perfect day to launch the program. Staff and volunteers from the United Way were present for an orientation. “This is just what the Farmington community needs. Food insecurity is a major issue in our community and United Way is excited to be a part of this effort to help address that,” remarked Nichole Ernest of the United Way of the Tri-Valley Area. Approximately 1 in 7 people in Farmington participate in SNAP. The United Way team plans to promote Maine Harvest Bucks among the vast network of service organizations in the Farmington area. There are farmers at the market who are already involved in food access programs like WIC and Senior FarmShare. Maine Harvest Bucks is another tool for the market in welcoming shoppers of all income levels. Farmers at the market who accept WIC expressed excitement about the program and spreading the word among their shoppers using WIC. The Farmington Farmers’ Market is poised for a successful Maine Harvest Bucks program. The market has dedicated vendors who play an active role in program operations. The market also has a strong local partner that is providing support with outreach, record-keeping and managing the info booth. The involvement of multiple stakeholders will help to ensure that the program will last for years to come. 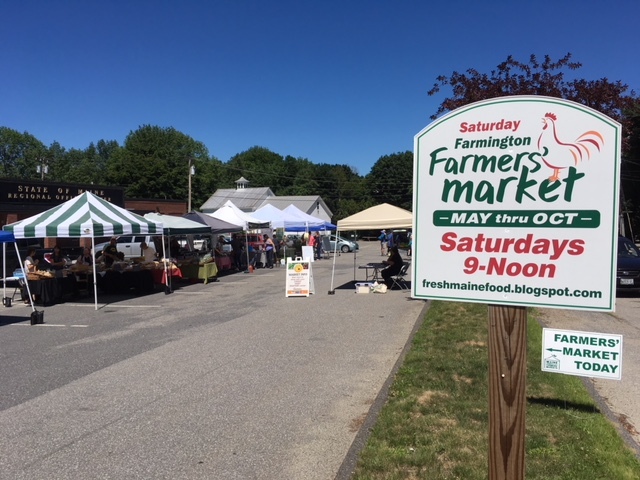 With over a thousand people participating in SNAP just in Farmington alone, there are certainly many more mouths that the farmers’ market can now feed!